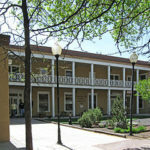 Every other Thursday evening Mark teaches a 1.5 hour mini-course at the downtown Santa Fe Public Library. These courses are mostly on scientific computing topics, but we dip in to other areas of computing. Students must have taken the 10-hour “Serious Programming” course. Students must have a computer running the GNU/Linux operating system, which will likely be the one we installed in the 10-hour Serious Programming course.